While my Clipper Race team met the huge challenge of the North Pacific crossing from Qingdao to Seattle, I took on a sailing challenge of a somewhat different nature. My challenge? Advance through a couple of levels of the Royal Yachting Association (RYA) sailing training program from my previous status of Day Skipper to Coastal Yachmaster. In anticipation, several anxieties surfaced. Could I learn all I needed to know and gain the additional boat handling experience required in the allotted 3 weeks? Would my new knee brace work well on the boat? Would the examiner be tough? As reassurance, and a source of constant joy, I thought of how lucky I am that my husband wants to do this with me! It was a very intense 3 weeks. A wonderful way to spend time with hubby, Steve, learning together and advancing our yachting knowledge and skills. week was a steep learning curve for the theory course, with reading and homework most nights and/or early mornings. Our class was a group of 4, all of whom would be taking the 2-day practical Yachmaster exam 2 weeks hence. We did manage 2 visits with our friends Sam and Nadia and their family that week. Partly because of that (missed doing some homework exercises those evenings!) and partly because I had to study for an additional practical exam for the following Saturday (VHF radio operator license), I didn't quite pass my chart work paper for the theory course on the first try. Fortunately, the yachtmaster practical exam was delayed 2 days because of weather (no wind!). I say fortunately, because it meant I could study the chart paper theory in more depth and get more efficient with the complicated series of steps required for addressing tidal streams and heights. 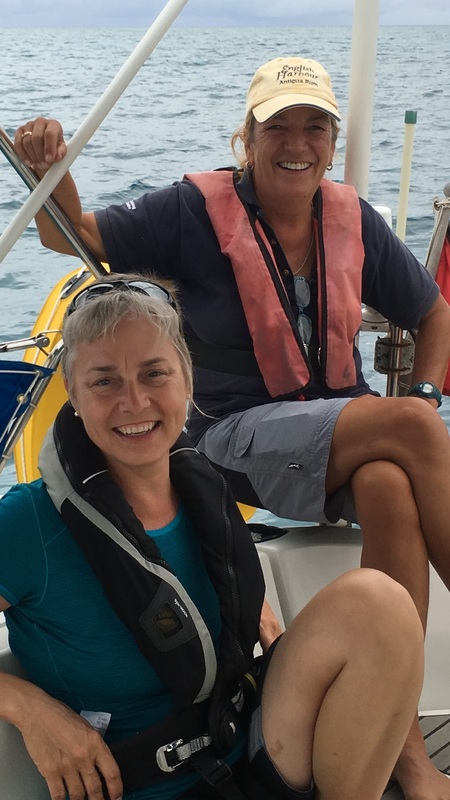 My instructor, Pippa, kindly allowed me to re-write the test a couple of hours before the yachtmaster practical exam was to start on Saturday. Happily, the other 2 test papers, also allotted 2 hours each, were no problem (topics: weather and collision regulations, known as "ColRegs"). Though not a requirement to take the yachtmaster practical exam, I was pleased to obtain my Yachmaster theory course completion certificate. Steve laying the anchor and Rich, approving. In preparation for the exam we had 2 weeks (10 days) on the water. 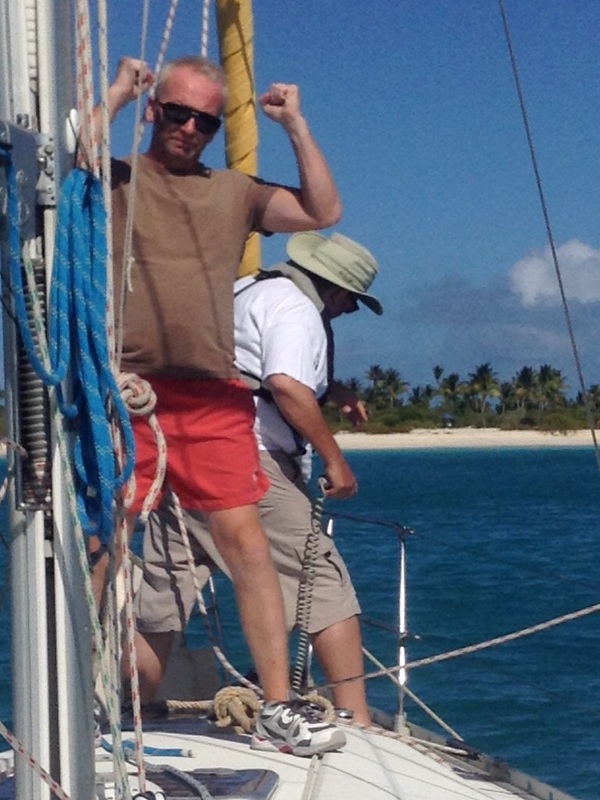 We (Steve and I, and 2 conspirators, Hugh and Neil) sort of turned the first week, with ace instructor Rich, into a yachting and fine dining tour of Antigua. Don't worry....We found lots of time to practice with close quarters boat handling, mooring, anchoring and MOB drills. 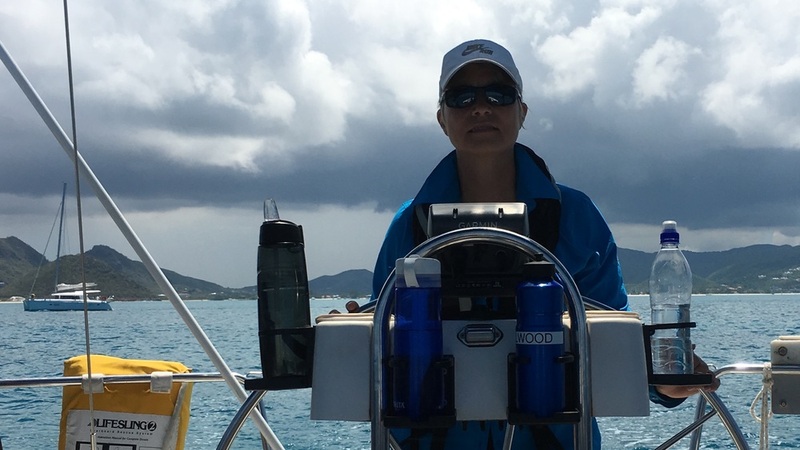 The following week, Pippa was our on board instructor for the exam prep week. Despite the lovely constant warm breeze, it wasn't all sailing. We spent time drilling ColRegs, too, as the standard is 100% for quizzes and application during the practical exam for this critical topic area. All of the 4 candidates had to adjust their travel plans because of the delay in the practical exam. Except that I couldn't, which meant I had to be assessed first so that I could get off the boat in time to catch my plane the next day. Quite nerve wracking to be the first one assessed, although the others also were given quizzes and chart assignments while my assessment was underway. When it came down to getting out on the water, though, they were my crew and I was the one in the spotlight mainly. Thank you, Pippa, for the confidence-building instruction! Sat eve - Chart task - plot EP on my birthday date near Plymouth, consider tidal stream. Grilled on the ColRegs - lights, day shapes and sound signals. Q&A re weather. Shown synoptic charts etc. to interpret. Assigned night passage to prepare. Skipper for the night. Get the boat ready (direct the crew) and off the dock and execute night pilotage plan into St John's Harbour (where the cruise ships go). Organized crew to get dinner cooked - we ate while underway. Handed off return pilotage to Steve, who took us into Hermitage Bay and anchored. Next morning (Sunday) I was skipper again. Planned a crazy route to SAIL off the anchor and SAIL through a TINY safe passage between a submerged rock and a very hard coastal rock cliff place. Continued sailing to try and find a small deep spot (seek 10 m depth contour) in the great big blue (about 2 nm offshore) - found it! None of this with electronic charts. Then motor sail to Jolly Harbour fairway buoy (very light winds). On the way, MOB exercise (the man over board was "Steve", a boat fender with a coiled line attached, so the real Steve couldn't help with the retrieval) - success! And then SAIL into the harbour (through a nearby anchorage) with short tacks through the narrowest part of the channel to the harbour. Stop at a mooring ball in the harbour under SAIL. Then on into the harbour with engine on and then reverse around a hammer head dock and continue reversing down a lane between slots/berths on one side and a wall on the other. Plant the boat on the wall tied on the port side. Carefully gauging wind speed effects and prop walk from the propeller, managed to gently kiss the dock with fenders as we came to a gentle stop on the wall. Fun! Fortunately for all this, we had rather benign weather conditions. How did my examiner sum it up? "Exemplary performance!" What relief! Congrats to the others, Steve, Dian and Neil, who went on to achieve their Yachmaster Offshore certifications! Note: While good for long term cruising plans, none of this will be particularly helpful on the ocean yacht racing adventure that resumes in my near future. More to come on that front very soon! Newer PostApril 24, 2016 - A lovely land-based travel interlude. Older PostMarch 10, 2016 - Toronto update - more sailing!